Tuesday evening 2nd April is your next chance to get on the scoreboard for this year’s Noel Morris Memorial Handicap Series. Rob P has kindly offered to officiate so I hope to give Bob and Victoria a run for their money(!). Wet but not windy, and rather cold at 6C, so some sogginess on the lower slopes made for an advantage for the stronger people. Sixteen of our hardier souls turned out, and a big “diolch” to Gwenan for her large umbrella and help officiating. Congratulations to Anwen for a decisive victory in what must be her best run for some time. Next race is the first Tuesday evening in April with a 6.30pm start. After a couple of weeks of low numbers doing Parkruns this week saw Denbigh Harriers out in force. Another Spring approaches and another Noel Morris Memorial Handicap series. As usual if your name isn’t on the list below and you want to run, please let me know on facebook, or just turn up on the night – remembering your recent best 5K or parkrun time will be helpful. Sunday 3rd March at 10am. On Friday night Denbigh Harriers’ Tony Benton was a first timer to the Dash in the Dark series held at night in Llandegla forest. He soon realised that his head torch was woefully inadequate for the job. Luckily for him the other 90 runners in the field had “proper” torches so he could see, by their lights, most of the looming tree roots and low hanging branches several steps before crashing into them. This is a lovely trail race that weaves through the forest using some of the lesser used tracks and trails. That the race is in darkness adds a novelty to the sense of excitement and he will definitely be doing this race again, albeit with a better head torch next time. Tony finished 29th in 34m 35s. 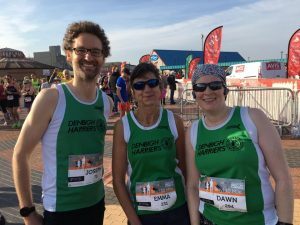 Vic Belshaw represented Denbigh Harriers in 16th Tarren Hendre Mountain Race 2019. 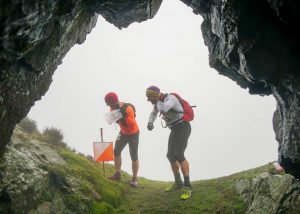 It was stormy weather and waterlogged terrain that set the scene at the start of the race. The poor visibility also caught a few people out with them missing a crucial turning point on high ground. There was quite a battle for the men’s over 50 category with Mercia, Buckley and Aberystwyth. The lead switched a few times on the steep 2,000’ climb to the summit. Vic went over the top first only for one of the Mercia men to overtake him on the descent back into the forest. 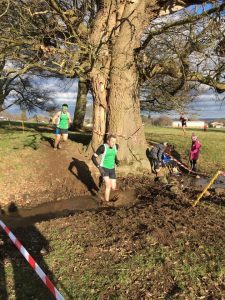 Once on the fast running terrain he made up ground and re-took the lead a quarter of a mile before the finish to win the category by 18s and placed 20th overall. It was fantastic race with great camaraderie at the finish and at presentations. The race was made extra special for Vic as as it was his son’s first mountain race and courses don’t come much tougher. 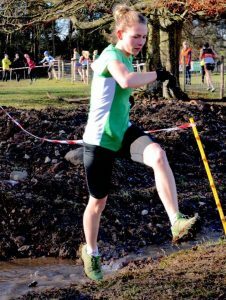 Emma Collins was the only Denbigh Harrier to run in the 4th border league race held at Tattenhall Cheshire. Conditions were cold and very blustery over a 6 mile undulating course with 450 ft climb. Emma was in her category and in the overall standings. Her time was 44:23 and good preparation for the Nick Beer 10K next month. 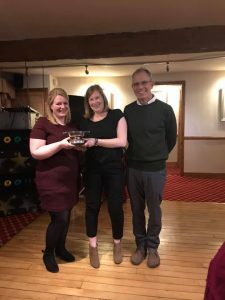 At the annual Denbigh Harriers Dinner the Alison Baugh Memorial Trophy for the club member of the year was shared by Mari Jones and Dawn Marshall. 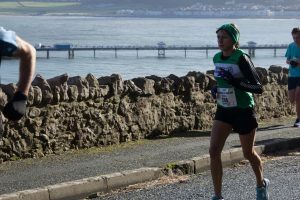 Five Denbigh Harriers took to the start line of Twin Piers 10 K With 434 other runners racing. There was the usual headwind but none of the dreadful conditions Twin Piers can be famous for. First Harrier home with Joe Welch in 39:30, 36th overall and 5th MV35 and delighted to feel comfortable racing coming back after two months of injury. Next over the line and improving on his time last year by well over a minute was Bob Neale in 49:55, 172nd overall and also took the M65 first place. 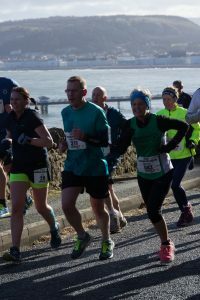 Next two Harriers were Ruth Crowther and Andy Morris both aiming for sub 60 and for Ruth this her first 10 K. We’re pleased to report both of them absolutely smashed it. Ruth coming home in 56:49, 272nd and Andy coming home in 58:31, 296th – congratulations to them both! Returning from illness and injury was Dawn Marshall one hour and 40 seconds, 318th nowhere near her PB on this course but in line with last year and used as a fitness test. A great day out for all 5 Harriers. 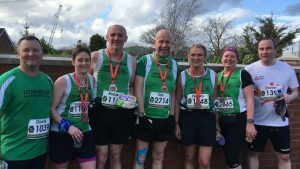 Two Denbigh Harriers took part in the Shropshire Mercia Hill Trial 2019 on Sunday. 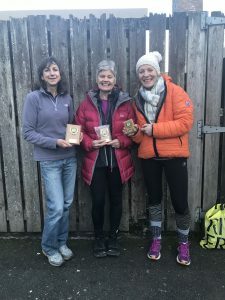 Superb mountain navigation event; thick freezing fog down to the valley base made for a technical course, especially for non-locals like us to the Shropshire Hills. We were in the third tranche of starters and taken on a coach to a secret location for the start of the linear course. Each team and individual competitor was started at a one minute interval and given their map. There were two courses, one medium and one long Tony Wood and Vic Belshaw opted for the medium which didn’t disappoint. Although they made one serious navigational error early on (along with several others) after that they were on were pretty much perfect lines and consistently moved up the field. It was a cracking day out and a big day as well with almost 10 miles and 3,000′ of ascent; and great team work. Vic was overall in the team category and Tony was placed 10th overall in the individual category. On a cold, wet misty morning, three Harriers made their way over to Helsby to run in the 4 Villages Half Marathon. Thankfully the rain stopped about 15 minutes before the start time, and then stayed off for the race. Hywel Roberts was the first Harrier home in 1:50:50, Ian Jones finished in 1:57:54 and Rob Parry crossed the line in 2:00:09. It was a nice, well-organised race with plenty of support and great marshalling. 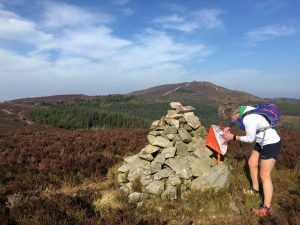 Brett Jones completed the 2019 Buff Winter Trail Wales in a time of 01:43:03 Pos-23 – 6th M40- he managed to knock 6 minutes off last years time. 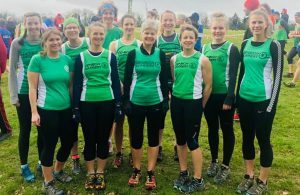 Nine Harriers ran Saturday morning Parkrun in New Zealand, England and Wales.